Las personas que eligen profesiones de ayuda a otros, poseen una actitud compasiva, que en los sanitarios se orienta a tratar, cuidar y aliviar la enfermedad o el sufrimiento ajeno. Frecuentemente su profesión los lleva a enfrentarse a situaciones de impacto emocional, a menudo con escasas habilidades para afrontarlas. Estar expuesto cotidianamente al sufrimiento, sin la conciencia apropiada para tomar la perspectiva adecuada, gestionar las emociones, y poder responder constructivamente, puede producir en el profesional sobreimplicación emocional, desgaste empático o estrés traumático secundario, y burnout. Recientes avances en neurociencias y psicología, facilitan una mejor comprensión de la relación de ayuda (profesional–paciente), y han evidenciado la influencia positiva de intervenciones formativas, adaptadas de prácticas contemplativas. Éstas permiten entrenar y cultivar habilidades que desarrollan la autoconciencia, una gestión emocional eficiente, mayor resiliencia y compasión. El desarrollo de estas habilidades fundamentales en el trabajo clínico, a través del entrenamiento, permiten evitar el contagio emocional y el distrés profesional, y como consecuencia fomentar una mayor satisfacción profesional. Aquí se revisan, algunas bases neurobiológicas de la empatía, la compasión, y la gestión emocional, y algunas evidencias sobre los beneficios de cultivar atención, autoconciencia, compasión y la metacognición, en el afrontamiento eficiente del sufrimiento y el bienestar de los profesionales que trabajan con el sufrimiento. Se presenta finalmente una propuesta de intervención orientada a promover entre los profesionales, la solidez y flexibilidad emocional necesarios para trabajar de forma segura, eficiente y gozosa, y recuperar el sentido humanista y compasivo de la vocación profesional. Halpern J. From Detached Concern to Empathy: Humanizing Medical Practice. Oxford University Press. 2001. 1-190 p.
Salovey P, Mayer JD. Emotional Intelligence. Baywood Publ Co, Inc. 1990; 9(3) :185–211. Ekman P. An Argument for Basic Emotions. Cogn Emot. 1992; 6(3–4) :169–200. Puchalski CM, Guenther M. Restoration and re-creation: Spirituality in the lives of healthcare professionals. Vol. 6, Current Opinion in Supportive and Palliative Care. 2012. p. 254–8. Grunfeld E, Zitzelsberger L, Coristine M, Whelan TJ, Aspelund F, Evans WK. Job stress and job satisfaction of cancer care workers. Psycho‐Oncology J Psychol Soc Behav Dimens Cancer. 2005; 14(1) :61–9. Block SD. Psychological considerations, growth, and transcendence at the end of life: the art of the possible. jama. 2001; 285(22) :2898–905. Raab K. Mindfulness, Self-Compassion, and Empathy Among Health Care Professionals: A Review of the Literature. J Health Care Chaplain. 2014; 20(3) :95–108. Kareaga AA, Exeberria SA, Smith JC. Assessment of Burnout and Psychological Wellbeing Among Health Professionals in the Basque Country. Psychol Spain. 2009; 13(1) :62–71. Romani M, Ashkar K. Burnout among physicians. Libyan J Med. 2014; 9(1) :23556. Maslach C, Jackson S. the Measurement of Experienced Burnout. J Occup Behav. 1981; 2(2) :99–113. Navarro-González D, Ayechu-Díaz A, Huarte-Labiano I. Prevalencia del síndrome del burnout y factores asociados a dicho síndrome en los profesionales sanitarios de Atención Primaria. Semer Fam. 2015; 41(4) :191–8. Soler JK, Yaman H, Esteva M, Dobbs F, Asenova RS, Katić M, et al. Burnout in European family doctors: the EGPRN study. Fam Pract. 2008; 25(4) :245–65. Shanafelt TD, Boone S, Tan L, Dyrbye LN, Sotile W, Satele D, et al. Burnout and satisfaction with work-life balance among US physicians relative to the general US population. Arch Intern Med. 2012; 172(18) :1377–85. Banerjee S, Califano R, Corral J, de Azambuja E, De Mattos-Arruda L, Guarneri V, et al. Professional burnout in European young oncologists: results of the European Society for Medical Oncology (ESMO) Young Oncologists Committee Burnout Survey. Ann Oncol. 2017; 28(7) :1590–6. Truchot D. Le burnout des étudiants en médecine. Rapport de recherche pour l’URML de Champagne-Ardenne [rapport]. Médecine Générale Reims. 2006; 30. Thirioux B, Birault F, Jaafari N. Empathy is a protective factor of burnout in physicians: New neuro-phenomenological hypotheses regarding empathy and sympathy in care relationship. Front Psychol. 2016; 7 :763. Whintrobe M, Thorn G, Adams R, Bennett I HB. Principios de Medicina Interna. Vol. 4a edición, Prensa Medica Mexicana. 1973. Meier DE. The Inner Life of Physicians and Care of the Seriously Ill. Jama. 2001; 286(23) :3007–14. Balint M. The doctor, his patient and the illness. In: London, UK: Tavistock Publications. 1957. Novack DH, Suchman AL, Clark W, Epstein RM, Najberg E, Kaplan C. Calibrating the physician: Personal awareness and effective patient care [Internet]. Vol. 278, Jama. Chicago: Amer Medical Assoc; 1997. p. 502–9. Kearney M, Weininger R. Whole person self-care: Self-care from the inside out. In: Whole person care: A new paradigm for the 21st century. 2011. p. 109–25. Stamm BH. Helping the Helpers: Compassion Satisfaction and Compassion Fatigue in Self-Care, Management, and Policy of Suicide Prevention Hotlines. Resour community suicide Prev. 2012; :1–4. Vago DR, Zeidan F. The brain on silent: mind wandering, mindful awareness, and states of mental tranquility. Ann N Y Acad Sci. 2016; 1373(1) :96–113. Hölzel BK, Carmody J, Vangel M, Congleton C, Yerramsetti SM, Gard T, et al. Mindfulness practice leads to increases in regional brain gray matter density. Psychiatry Res - Neuroimaging. 2011; 191(1) :36–43. Preckel K, Kanske P, Singer T. On the interaction of social affect and cognition: empathy, compassion and theory of mind. Current Opinion in Behavioral Sciences. 2018. Singer T, Klimecki OM. Empathy and compassion. Curr Biol. 2014; 24(18) :R875–8. Batson CD. These Things Called Empathy: Eight Related but Distinct Phenomena. In: The Social Neuroscience of Empathy. 2009. Eisenberg N, Eggum ND. Empathic Responding: Sympathy and Personal Distress. In: The Social Neuroscience of Empathy. 2009. Ashar YK, Andrews-Hanna JR, Dimidjian S, Wager TD. Empathic Care and Distress: Predictive Brain Markers and Dissociable Brain Systems. Neuron. 2017; 94(6) :1263–1273.e4. Leiberg S, Klimecki O, Singer T. Short-term compassion training increases prosocial behavior in a newly developed prosocial game. PLoS One. 2011; 6(3) :e17798. Jazaieri H, McGonigal K, Lee IA, Jinpa T, Doty JR, Gross JJ, et al. Altering the Trajectory of Affect and Affect Regulation: the Impact of Compassion Training. Mindfulness (N Y). 2018; 9(1) :283–93. Valk SL, Bernhardt BC, Trautwein FM, Böckler A, Kanske P, Guizard N, et al. Structural plasticity of the social brain: Differential change after socio-affective and cognitive mental training. Sci Adv. 2017; 3(10). de Waal FBM. Putting the Altruism Back into Altruism: The Evolution of Empathy. Annu Rev Psychol. 2008; 59(1) :279–300. Decety J, Jackson PL. The functional architecture of human empathy. Behav Cogn Neurosci Rev. 2004; 3(2) :71–100. Fan Y, Duncan NW, de Greck M, Northoff G. Is there a core neural network in empathy? An fMRI based quantitative meta-analysis. Neurosci Biobehav Rev. 2011; 35(3) :903–11. Lamm C, Decety J, Singer T. Meta-analytic evidence for common and distinct neural networks associated with directly experienced pain and empathy for pain. Neuroimage. 2011; 54(3) :2492–502. Van Overwalle F, Baetens K. Understanding others’ actions and goals by mirror and mentalizing systems: A meta-analysis. NeuroImage. 2009. Zaki J, Ochsner K. The neuroscience of empathy: Progress, pitfalls and promise. Nature Neuroscience. 2012. Ashar YK, Andrews-Hanna, J. R., Dimidjian S, Wager TD. Towards a neuroscience of compassion: A brain systems-based model and research agenda. Neuron. 2017; 94(6) :1263–73. Barrett LF, Satpute AB. Large-scale brain networks in affective and social neuroscience: Towards an integrative functional architecture of the brain. Curr Opin Neurobiol. 2013; 23(3) :361–72. Chang LJ, Yarkoni T, Khaw MW, Sanfey AG. Decoding the role of the insula in human cognition: Functional parcellation and large-scale reverse inference. Cereb Cortex. 2012; 23(3) :739–49. Duerden EG, Arsalidou M, Lee M, Taylor MJ. Lateralization of affective processing in the insula. Neuroimage. 2013; 78 :159–75. Batson CD. Altruism in Humans. Oxford University Press, USA. 2011. Shamay-Tsoory SG, Aharon-Peretz J, Perry D. Two systems for empathy: A double dissociation between emotional and cognitive empathy in inferior frontal gyrus versus ventromedial prefrontal lesions. Brain. 2009; 132(3) :617–27. Meyer ML, Masten CL, Ma Y, Wang C, Shi Z, Eisenberger NI, et al. Empathy for the social suffering of friends and strangers recruits distinct patterns of brain activation. Soc Cogn Affect Neurosci. 2012; 8(4) :446–54. Frith CD, Frith U. The Neural Basis of Mentalizing. Neuron. 2006; 50(4) :531–4. Lieberman MD. Social Cognitive Neuroscience: A Review of Core Processes. Annu Rev Psychol. 2007; 58 :259–89. Zaki J, Weber J, Bolger N, Ochsner K. The neural bases of empathic accuracy. Proc Natl Acad Sci. 2009; 106(27) :11382–7. Goetz J, Keltner D, Simon-Thomas E. Compassion: an evolutionary analysis and empirical review. Psychol Bull. 2010; 136(3) :351. Singer T, Lamm C. The social neuroscience of empathy. Ann N Y Acad Sci. 2009; 1156(1) :81–96. Mascaro JS, Rilling JK, Tenzin Negi L, Raison CL. Compassion meditation enhances empathic accuracy and related neural activity. Soc Cogn Affect Neurosci. 2012; 8(1) :48–55. Klimecki O, Singer T. Empathic Distress Fatigue Rather Than Compassion Fatigue? Integrating Findings from Empathy Research in Psychology and Social Neuroscience. Pathol Altruism. 2012; :368–83. Weng HY, Fox AS, Shackman AJ, Stodola DE, Caldwell JZK, Olson MC, et al. Compassion Training Alters Altruism and Neural Responses to Suffering. Psychol Sci. 2013; 24(7) :1171–80. Condon P, Desbordes G, Miller WB, DeSteno D. Meditation Increases Compassionate Responses to Suffering. Psychol Sci. 2013; 24(10) :2125–7. Porges SW. The polyvagal theory: New insights into adaptive reactions of the autonomic nervous system. Nat Rev Cancer. 2009; :1–8. Cozolino L. The Neuroscience of Human Relationships: Attachment and the Developing Social Brain. New York: W W Norton & Co; 2006. Porges SW, Furman SA. The early development of the autonomic nervous system provides a neural platform for social behaviour: A polyvagal perspective. Infant Child Dev. 2011; 20(1) :106–18. Siegel DJ. The mindful brain: Reflection and attunement in the cultivation of well-being. WW Norton & Company; 2007. Porges SW. The Polyvagal Theory: Phylogenetic contributions to social behavior. Physiol Behav. 2003; 79(3) :503–13. Porges SW. The polyvagal perspective. Biol Psychol. 2007; 74 :116–43. Geller SM, Porges SW. Therapeutic presence: Neurophysiological mechanisms mediating feeling safe in therapeutic relationships. J Psychother Integr. 2014; 24(3) :178–92. Porges SW. The polyvagal theory: Phylogenetic substrates of a social nervous system. Int J Psychophysiol. 2001; 42(2) :123–46. Segerstrom SC, Nes LS. Heart rate variability reflects self-regulatory strength, effort, and fatigue. Psychol Sci. 2007; 18(3) :275–81. McCraty R. Coherence: Bridging personal, social and global health. Altern Ther Heal Med. 2010; 16(4) :10–24. Thayer JF, Åhs F, Fredrikson M, Sollers JJ, Wager TD. A meta-analysis of heart rate variability and neuroimaging studies: Implications for heart rate variability as a marker of stress and health. Neurosci Biobehav Rev. 2012; 36(2) :747–56. Geller SM, Greenberg LS. Therapeutic presence: A mindful approach to effective therapy. American Psychological Association; 2012. Kirby JN, Doty JR, Petrocchi N, Gilbert P. The Current and Future Role of Heart Rate Variability for Assessing and Training Compassion. Front Public Heal. 2017; 5 :40. Tang Y-Y, Lu Q, Geng X, Stein EA, Yang Y, Posner MI. Short-term meditation induces white matter changes in the anterior cingulate. Proc Natl Acad Sci. 2010; 107(35) :15649–52. Pickut BA, Van Hecke W, Kerckhofs E, Mariën P, Vanneste S, Cras P, et al. Mindfulness based intervention in Parkinson’s disease leads to structural brain changes on MRI: a randomized controlled longitudinal trial. Clin Neurol Neurosurg. 2013; 115(12) :2419–25. Mills J, Chapman M. Compassion and self-compassion in medicine: Self-care for the caregiver. Australas Med J. 2016; 9(5) :87–91. Clode D BJ. Keeping the doctor alive: A self-care guidebook for medical practitioners. South Melbourne, VIC: Royal Australian College of General Practitioners; 2006. Cebolla i Martí, Ausiàs Josep, García-Campayo, J., & Demarzo M. Mindfulness y ciencia. Madrid: Alianza Editorial; 2014. Sansó N, Galiana L, Oliver A, Pascual A, Sinclair S, Benito E. Palliative care professionals’ inner life: Exploring the relationships among awareness, self-care, and compassion satisfaction and fatigue, burnout, and coping with death. J Pain Symptom Manage. 2015; 50(2) :200–7. Simón Pérez VM. Mindfulness y psicología: presente y futuro. Inf psicológica. 2010; (100) :162–70. Kearney MK, Weininger RB, Vachon MLS, Harrison RL, Mount BM. Self-care of physicians caring for patients at the end of life:“Being connected... a key to my survival.” JAMA. 2009; 301(11) :1155–64. Kearney M, Weininger R. Whole person self-care: Self-care from the inside out. Springer, New York, NY. 2011; :109–25. Harrison RL. Preventing vicarious traumatization of mental health therapists: identifying protective practices. 2007. Krasner MS, Epstein RM, Beckman H, Suchman AL, Chapman B, Mooney CJ, et al. Association of an educational program in mindful communication with burnout, empahty and attitudes among primary care physicians. Jama. 2009; 302(12) :1284–93. Sansó N, Galiana L, Cebolla A, Oliver A, Benito E, Ekman E. Cultivating Emotional Balance in Professional Caregivers: a Pilot Intervention. Mindfulness (N Y). 2017; 8(5) :1319–27. Woolley H, Stein A, Forrest GC, Baum JD. Cornerstone Care for Families of Children with Life-Threatening Illness. Dev Med Child Neurol. 1991; 33(3) :216–24. Cole R. Meditation in palliative care - A practical tool for self-management [Internet]. Vol. 11, Palliative Medicine. London: Arnold, Hodder Headline Plc; 1997. p. 411–3. Epstein RM. Mindful practice. Jama. 1999; 282(9) :833–9. Barnard D. Crossing Over: Narratives of Palliative Care [Internet]. Oxford University Press. 2000. 1-. Dobkin PL. Mindfulness and Whole Person Care. In: Hutchinson TA, editor. Whole Person Care: A New Paradigm for the 21st Century. New York, NY: Springer New York; 2011. p. 69–82. Katz RS. When our personal selves influence our professional work: an introduction to emotions and countertransference in end of life care. In: When professionals weep: Emotional and countertransference responses in end-of-life care. Routledge; 2006. 3-12 p.
Wallace BA, Shapiro SL. Mental balance and well-being: Building bridges between Buddhism and Western psychology. Am Psychol. 2006; 61(7) :690–701. Kabat-Zinn J. An outpatient program in behavioral medicine for chronic pain patients based on the practice of mindfulness meditation: Theoretical considerations and preliminary results. Gen Hosp Psychiatry. 1982; 4(1) :33–47. Kabat-Zinn J. Vivir con plenitud las crisis Ed. Revisada: Cómo utilizar la sabiduría del cuerpo y de la mente para enfrentarnos al estrés, el dolor y la enfermedad. Editorial Kairós; 2016. Vøllestad J, Sivertsen B, Nielsen GH. Mindfulness-based stress reduction for patients with anxiety disorders: Evaluation in a randomized controlled trial. Behav Res Ther. 2011; 49(4) :281–8. Segal Z, Williams M, Teasdale J. Terapia cognitiva basada en el mindfulness para la depresión. Editorial Kairós; 2015. Kemeny ME, Foltz C, Cavanagh JF, Cullen M, Giese-Davis J, Jennings P, et al. Contemplative/emotion training reduces negative emotional behavior and promotes prosocial responses. Emotion. 2012; 12(2) :338. Ekman E, Ekman P. Cultivating emotional balance: Structure, Research, and implementation. Compassion Bridg Pract Sci. 2013; :398–414. Jazaieri H, Jinpa GT, McGonigal K, Rosenberg EL, Finkelstein J, Simon-Thomas E, et al. Enhancing Compassion: A Randomized Controlled Trial of a Compassion Cultivation Training Program. J Happiness Stud. 2013; 14(4) :1113–26. Brooker J, Julian J, Webber L, Chan J, Shawyer F, Meadows G. Evaluation of an Occupational Mindfulness Program for Staff Employed in the Disability Sector in Australia. Mindfulness (N Y). 2013; 4(2) :122–36. Asuero AM, Queraltó JM, Pujol‐Ribera E, Berenguera A, Rodriguez‐Blanco T, Epstein RM. Effectiveness of a mindfulness education program in primary health care professionals: a pragmatic controlled trial. J Contin Educ Health Prof. 2014; 34(1) :4–12. Manotas M, Segura C, Eraso M, Oggins J, McGovern K. Association of brief mindfulness training with reductions in perceived stress and distress in Colombian health care professionals. Int J Stress Manag. 2014; 21(2) :207. Asuero AM, Blanco TR, Pujol-Ribera E, Berenguera A, Queraltó JM. Evaluación de la efectividad de un programa de mindfulness en profesionales de atención primaria. Gac Sanit. 2013; 27(6) :521–8. Neff KD, Pommier E. The relationship between self-compassion and other-focused concern among college undergraduates, community adults, and practicing meditators. Self Identity. 2013; 12(2) :160–76. Shapiro SL, Astin JA, Bishop SR, Cordova M. Mindfulness-based stress reduction for health care professionals: Results from a randomized trial. Int J Stress Manag. 2005; 12(2) :164–76. Song Y, Lindquist R. Effects of mindfulness-based stress reduction on depression, anxiety, stress and mindfulness in Korean nursing students. Nurse Educ Today. 2015; 35(1) :86–90. Barbosa P, Raymond G, Zlotnick C, Wilk J, Toomey R, Mitchell J. Mindfulness-based stress reduction training is associated with greater empathy and reduced anxiety for graduate healthcare students. Educ Heal. 2013; 26(1) :9. Dobie A, Tucker A, Ferrari M, Rogers JM. Preliminary evaluation of a brief mindfulness-based stress reduction intervention for mental health professionals. Australas Psychiatry. 2016; 24(1) :42–5. Bazarko D, Cate RA, Azocar F, Kreitzer MJ. The Impact of an Innovative Mindfulness-Based Stress Reduction Program on the Health and Well-Being of Nurses Employed in a Corporate Setting. J Workplace Behav Health. 2013; 28(2) :107–33. Kemper KJ, Khirallah M. Acute Effects of Online Mind–Body Skills Training on Resilience, Mindfulness, and Empathy. J Evidence-Based Complement Altern Med. 2015; 20(4) :247–53. Johnson JR, Emmons HC, Rivard RL, Griffin KH, Dusek JA. Resilience Training: A Pilot Study of a Mindfulness-Based Program with Depressed Healthcare Professionals. Explor J Sci Heal. 2015; 11(6) :433–44. Mealer BM, Conrad D, Evans J, Jooste K, Solyntjes J, Rothbaum B. Feasibility and acceptability of a resilience training program for intensive care unit nurses. Am J Crit Care. 2014; 23(6) :e97–105. 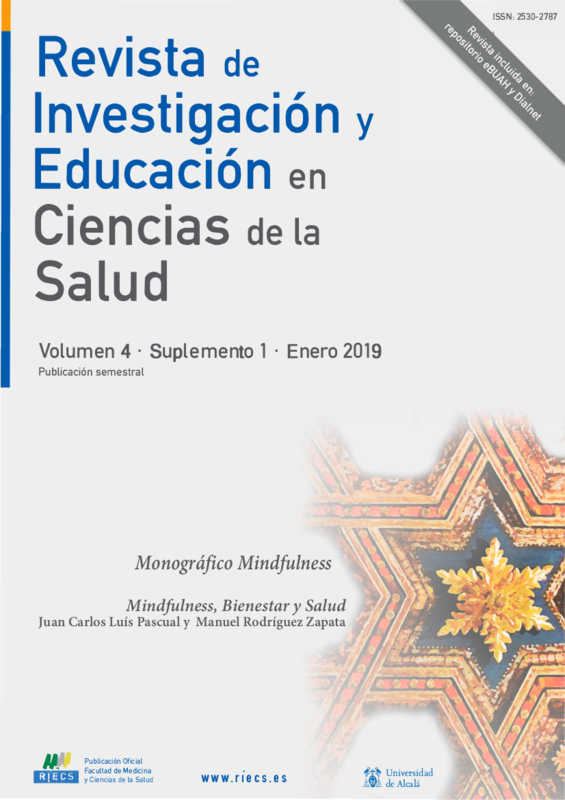 Aranda Auserón G, Elcuaz Viscarret MR, Fuertes Goñi C, Güeto Rubio V, Pascual Pascual P, Sainz de Murieta García de Galdeano E. Evaluación de la efectividad de un programa de mindfulness y autocompasión para reducir el estrés y prevenir el burnout en profesionales sanitarios de atención primaria. Aten Primaria. 2018; 50(3) :141–50. Sansó N, Galiana L, Oliver A, Cuesta P, Sánchez C, Benito E. Evaluación de una Intervención Mindfulness en Equipos de Cuidados Paliativos. Pschosocial Interv. 2018; 27(2) :81–8. Neff KD, Germer CK. A Pilot Study and Randomized Controlled Trial of the Mindful Self-Compassion Program. J Clin Psychol. 2013; 69(1) :28–44. Davidson RJ, Schuyler BS. Neuroscience of happiness. World happiness Rep. 2015; :88–105. Australian Health Workforce Advisory Committee. Australian mental health nurse supply, recruitment and retention. AHWAC, Sydney 2003. Consejo Oficial de Colegios Oficiales de Médicos. Guía de Ética Médica. 2011; 91 :431–96.